Microsoft has released yet another Windows 10 Insider Preview Build 14390 to Windows Insiders on the Fast ring, for both PC and mobile, which makes Windows 10 Build 14390 a step closer to be the official RTM build for Windows 10 Anniversary Update, codenamed Redstone. 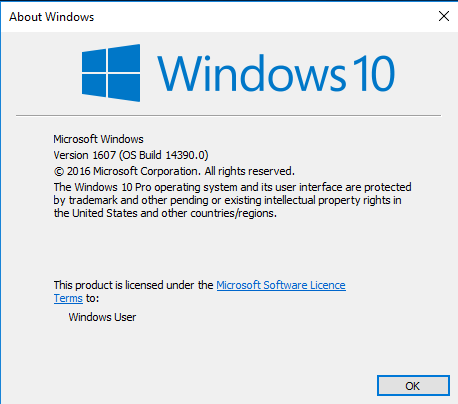 Windows 10 Build 14390 has the full build string of 10.0.14390.0.rs1_release.160712-1452, and is of version 1607, the version which Windows 10 Anniversary Update will update Windows 10 to. Currently, Windows 10 November Update released in November 2015 is version 1511. Similar to previous few recent builds, Windows 10 Build 14390 no longer has the pre-release agreement. In fact, all pre-release software features such as watermark, timetimb and license terms have been removed or replaced, making it harder to know which build is going to be the RTM (released to manufacturing). However, with official general availability date of Windows 10 Anniversary Update as August 2nd, 2016, the most recent build released has a high chance as potential RTM candidate. Amazon Assistant: Amazon’s official browser extension is now available for Microsoft Edge! Amazon Assistant helps you make better decisions wherever you shop online by giving you access to Deal of the Day, Product Comparison, Wish List and Shortcuts to your favorite Amazon destinations. Check out all of the available extensions by launching Microsoft Edge, opening the “…”menu, selecting “Extensions” and then clicking “Get extensions from the Store”. For Windows Insiders on the Fast ring, open the Settings app, then go to Update & security -> Windows Update -> Check for updates to download and install build 14390.